Hi Friends! For our first project we’re going to talk about mail. I’m talking the kind that requires a stamp (or several) and takes a few days to arrive at someone elses house. Oh, you want to know what there is possibly to say about it? How about you can basically send any sort of paper or object (subject to the rules here) through the mail? Yes that’s right. You can send Easter eggs, scraps of paper, cardboard etc. A friend of mine is going through a rough mental spot so I thought getting real mail would be a nice treat for her. What to send her though? I mean I have an endless supply of greeting cards and can make others, but I thought I’d send her something special today. Somethings to note for this project: The minimum size for mail is 3 1/2″ x 5″ and the maximum size is 6 1/8″ x 11 1/2″ (here is the info on sizes and shapes of mail that you might find useful) And you can use anything! 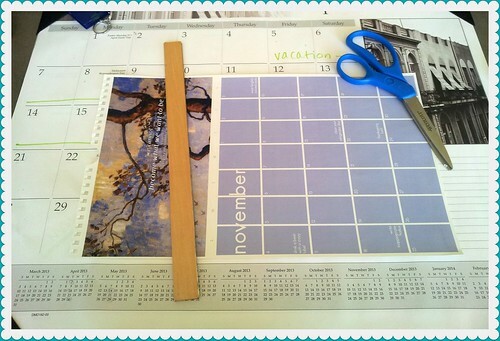 For today, I’m using a page from Yes and Yes’s 2012 calendar and going to make a simple trifold mailing. What you want to make something from. First things first. Trim the edge off the top and if you want the rest of the edges too. I trimmed the fringe and only the bottom off for this project and it ended up folding in thirds nicely. Next you want to add a little bit of yourself to it. I know my friend would love the color scheme and the design, but there were already some suggestions of what to do on certain days. I added notes to that. If you can’t see the notes, in the upper left, I changed “have a beer with a crazy label” to have ice cream with a crazy label”. 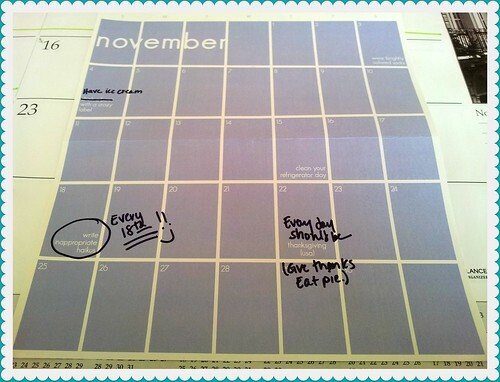 Then the last outside note I made was that “Every day should be Thanksgiving. Give thanks and eat pie!” I know what I added would make my friend smile and then I turned it over and wrote a more personal note on the inside. I didn’t photo that part because it’s personal. Next I folded it up and measured to make sure I was within the necessary requirements. (Remember the address should be parallel to the long side to avoid extra charges!) Here’s what the front and back ended up looking like: Last thing left to do is to put a little tape on the edges so sneaky eyes can’t pry (Also so it goes through the machines with less chance of incident. I used 3 pieces of tape about an inch in a half long), address it, and put a stamp on it! There you have it, use something cool to send someone a surprise in the mail. 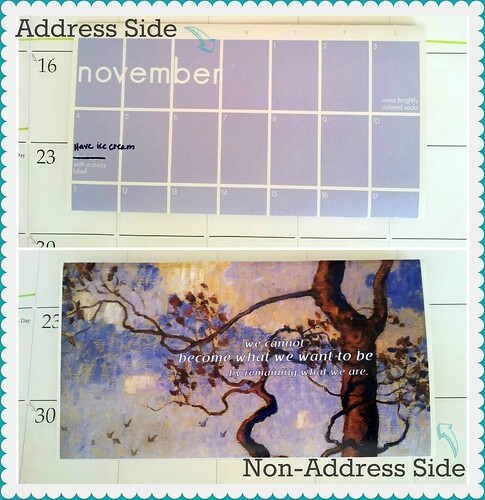 This entry was posted in Crafting, photo and tagged Friends, Mail, project, send a smile, yes and yes. Bookmark the permalink.